Erase Every Other Row is similar to the Deinterlace filter, but, instead of interpolating the erased row with the surrounding ones, it replaces the erased row with transparency or with the background color.Erase Every Other Row can also operate on vertical stripes. 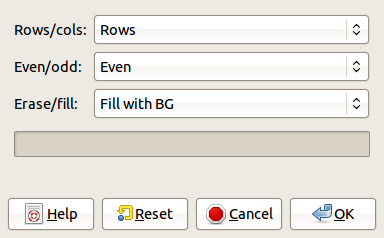 The Erase Every Other Row dialog is simple. 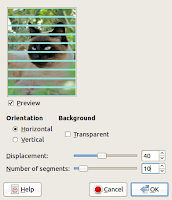 Choose between rows and columns, between even or odd, and between transparency (erase) or the background color (fill)--unless the layer lacks an Alpha channel, in which case the only option is the background color. 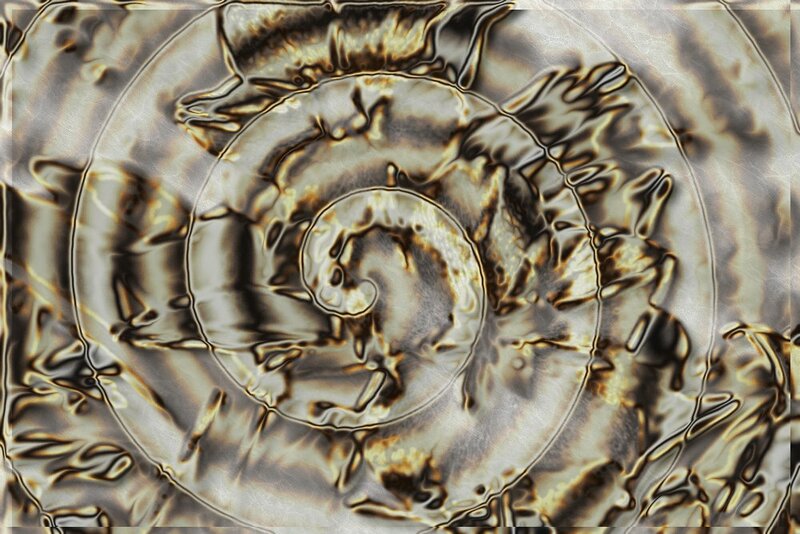 Video simulates the distortions that can occur in an image that was captured with a video camera. 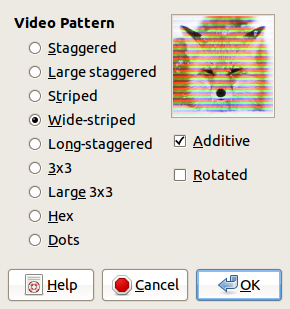 The dialog is unusual, since the preview of the various video patterns is displayed on a fixed image of a fox, rather than on the image being transformed. 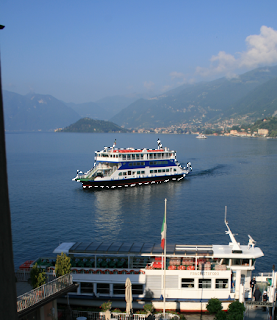 Additive adds the pattern to the image; otherwise it's subtracted. Rotated rotates the pattern by 90 degrees. To see the effects of the various video patterns, click through them in the dialog. The Figure shows the result of applying a Wide-striped Video Pattern to Figure 2.33. 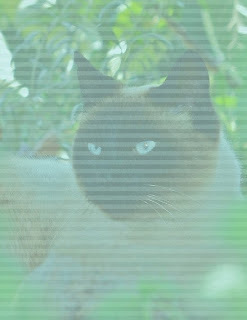 The Xach-Effect filter adds a translucent 3D effect to a selection or Alpha channel. We created a rectangular selection in the image. 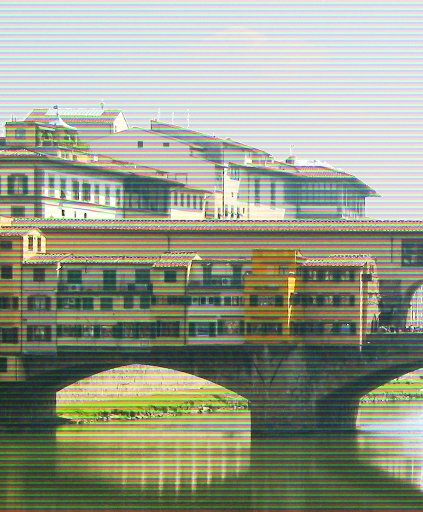 The Xach-Effect filter works by detaching the selection from the image and moving it by the Highlight offset amount specified in the dialog. 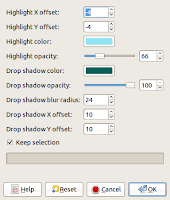 The Highlight color appears around the detached selection, and its Highlight Opacity is an Alpha value in [0 to 255], which means the default of 66 is equivalent to 26\%. 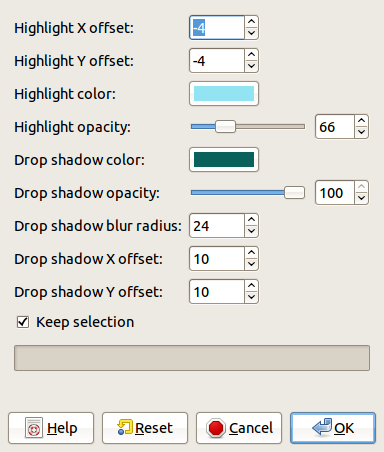 The last three fields specify the drop shadow parameters, just like in the Drop Shadow filter. Finally, if the Keep selection box is checked, the selection remains after the filter is run. The Blinds filter simulates the effect of blinds in front of the image. The effect of Blinds is demonstrated on the image of Figure 17.53. You can choose the orientation of the blind blades, their width (called Displacement), and their number. The blinds can be the current Background color or Transparent. The Predator dialog does not include a preview. 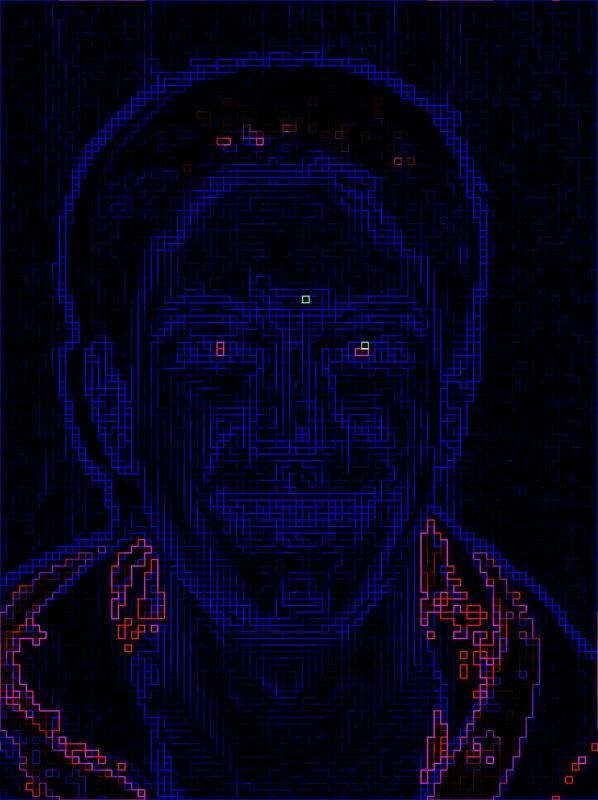 The filter uses an edge-detect algorithm, and Edge amount in [0 to 24] changes the sensitivity of the edge detection. 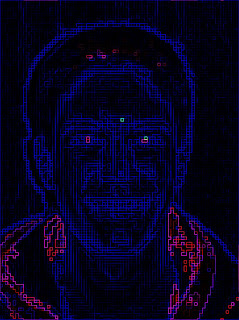 If Pixelize is checked, the filter applies pixelization to the result. 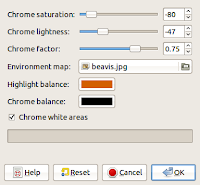 Set the amount of pixelization via Pixel amount in [1 to 16]. If Keep selection is checked, the filter is applied to the current selection, and if not, it's applied to the current layer. 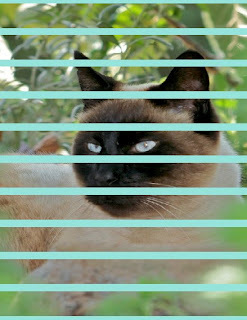 If Separate layer is checked, the filter leaves the original layer untouched and creates a new layer. The Slide filter requires an RGB image with only one layer. It builds a color transparency with border and holes and crops or resizes the image so its proportions are 3:2, which are the proportions of a 32~mm slide. 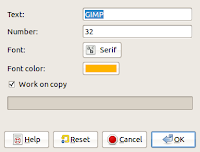 The Slide dialog allows you to input text that is printed in the slide borders and number of the slide and choose the font family and the font color. 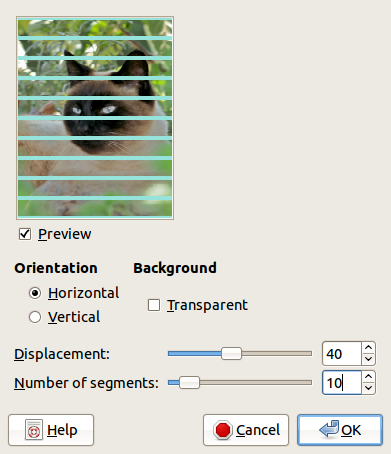 As with the preceding filters, a checkbox allows you to create a new image instead of changing the original. 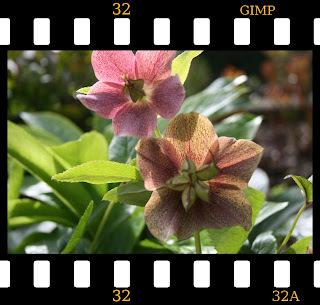 The Filmstrip filter simulates a strip of positive photographic film (remember those?) with one or more photographs. Before choosing the filter, open the target images in GIMP. 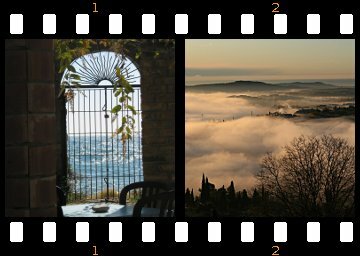 In the Image Selection area of the dialog, the left column shows the images that are open, and the right column shows the images that will be included in the film. Add an image to the right column by selecting it in the left column and clicking +Add. 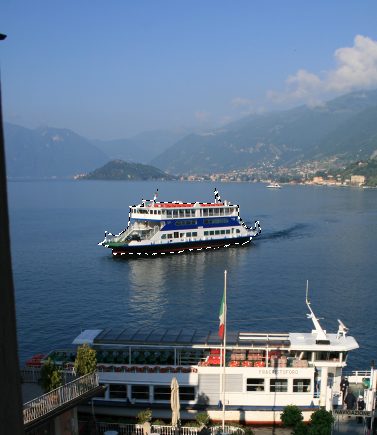 Conversely, remove an image from the right column by clicking its name and then -Remove. 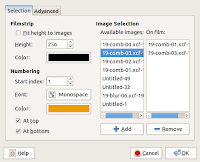 The Height of the resulting images can be set in the corresponding field or will be determined based on the images used if the Fit height to images box is checked. 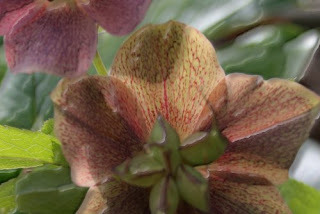 The Color will be the color of the film surrounding the images. 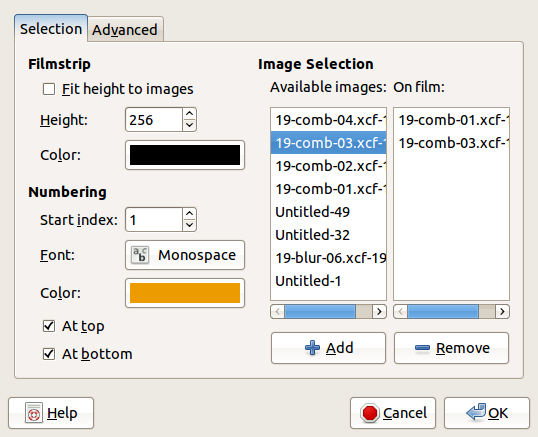 Images are numbered in the film, according to the adjustable parameters: Start index, Font, Color, and position in the film (At top or At bottom). The Advanced tab, not shown here, allows you to change the sizes of all the components of the simulation relative to the image size. The default values have been computed to simulate a filmstrip correctly, making adjustments on the Advanced tab generally leads to strange and unnatural results. Stencil Carve uses a grayscale source image as a stencil to carve a design into a target image of the same size. 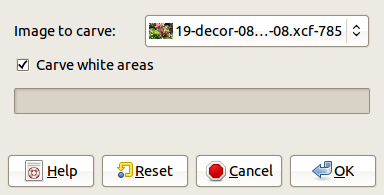 The source image must have only one layer without an Alpha channel, otherwise the filter name is grayed out in the Decor menu. 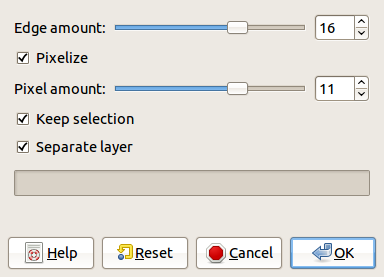 The Stencil Carve dialog contains only two parameters: a menu to select the target image and a checkbox to select Carve White Areas. 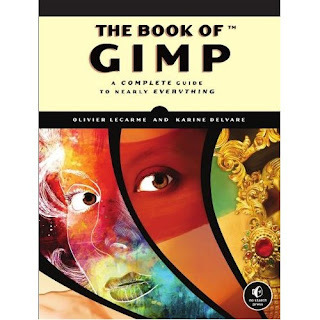 If the box is unchecked, the inverse of the source image is used as the stencil. A possible result is shown here. The source image was a grayscale copy of the target image. 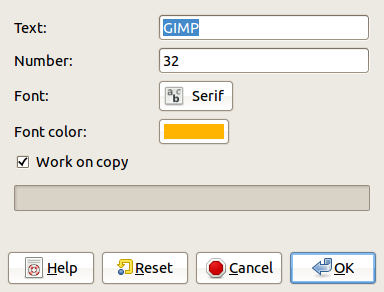 Stencil Chrome also requires a grayscale image without an Alpha channel. 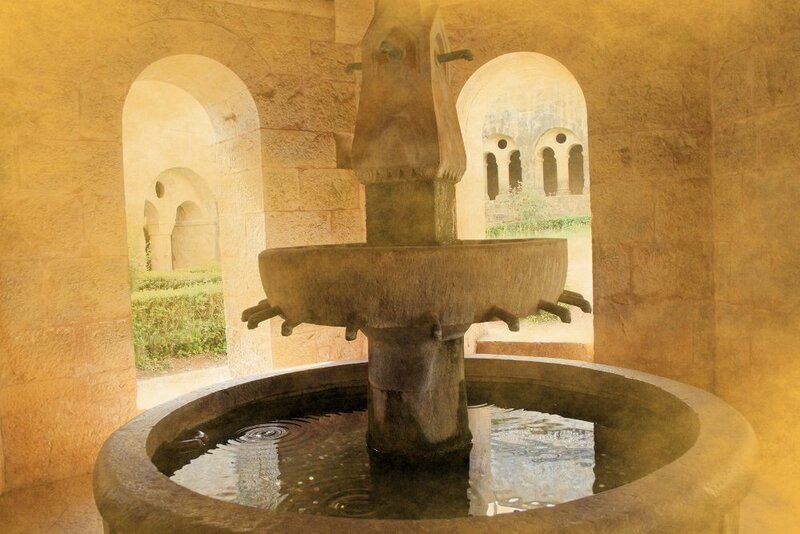 This filter uses an environment map as a stencil to add a chrome effect to the source image. 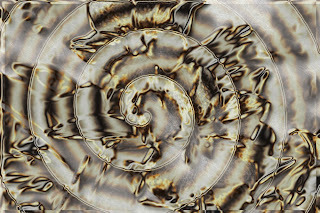 The figure shows the result of applying the Stencil Chrome filter with a spiral gradient. The environment map is also a grayscale image, which has to be the same size as the original. 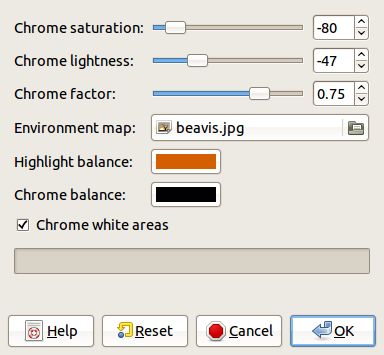 Rather than selecting an image open in GIMP, you can choose the environment map from anywhere on your drive. The various parameters are rather self-explanatory. This filter is rather unstable, however, which means that from time to time it crashes. Be sure to save your image before working with it. 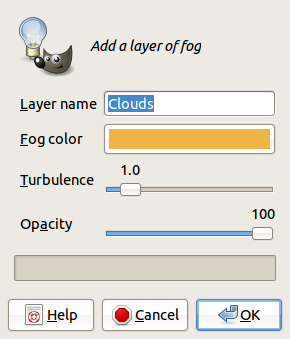 Fog creates a new layer above the current layer in the image, and adds a semi-transparent fog. 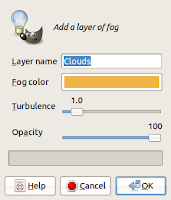 The dialog contains only four parameters: the name of the new layer, the color of the fog (the default color produces a sulfurous, cough-inducing smoke), its turbulence [1 to 10] and its opacity.